Home » Blog » Garfield’s 61st Book Available for Pre-order! I don’t think there’s any way that we’re gonna get sick of this lazy fat tabby cat. It’s been 38 years and Garfield still makes us laugh! Whether it’s through the comics, the games, the shows, or the books, he remains a household favorite. Like lasagna! 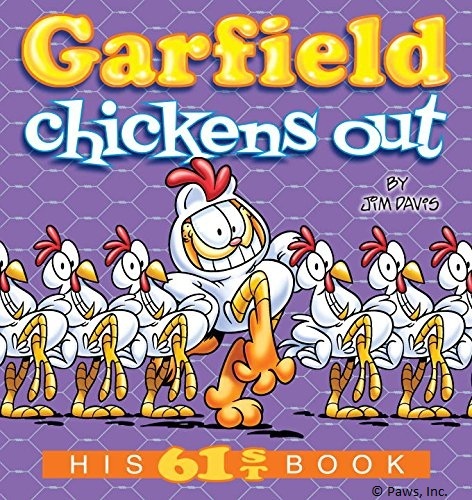 This May 10, 2016, the 61st book called Garfield Chickens Out will be available both on paperback and on Kindle! Wanna be first? Well, it’s available for pre-order on Amazon so grab it now. If you missed the previous book, Garfield Cleans His Plate, you can order that, too! Garfield Chickens Out follows Garfield in one of his many shenanigans. This time, involving a special occasion in Jon’s life! Get a ton of laughs at a discounted price if you pre-order now!